Luckily, I have found a quick in-a-pinch solution to all this agony... siblings. Thank heavens for the twins! And the fact that they have had absolutely no trace of the dreaded "first born syndrome." (probably the result of being born with a sibling straight off the bat) They love & embrace little brother... and play with him! (mostly without overly hassling/tackling/fighting with him) It's truly a miracle of epic proportions. Like yesterday after naps, I desperately needed to fold some darned laundry! The piles of clean clothes were getting dusty! There was no way I was washing those clothes again. No, sir! 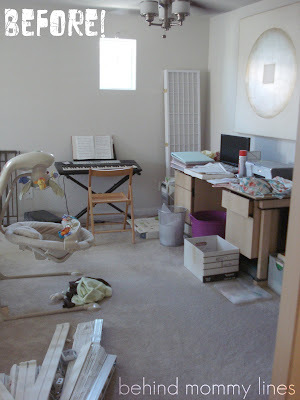 As I began to tackle this task, the girls chimed up with requests to "help Mama!" I just wanted to get this stuff d.o.n.e. and in a hurry. I couldn't waste more time and mental consumption having the girls "help" with the laundry. 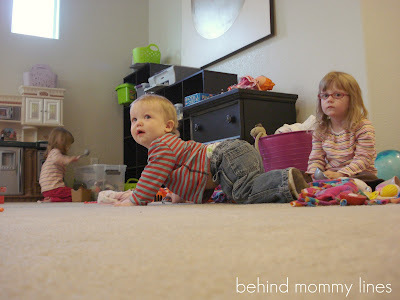 (ie: clothes strewn, bunched, and stacked all over the place) So I told them exactly how they could help Mommy. It worked! And contrary to what Bunny's face may be telling you, everyone was having a ball. If there's anything Little Man loves more than uninterrupted Mama attention, it would be unadulterated sister play. He looks up to those two as I'm sure all little brothers look up to their awesomely cool big sisters (wink, wink, Trent) ...Sometimes it's disturbing because I know he's thinking about jump-flying off the arms of the couch as I'm chastising the girls to "Stop it! Right now!" In the end, the girls gave me about ten minutes of practically uninterrupted time to get crap done. It was incredibly nice; And it made me rethink my previous stance of "three kids is just three too many." (well for a moment there) When they play so sweetly altogether, it melts my heart plain and simple. 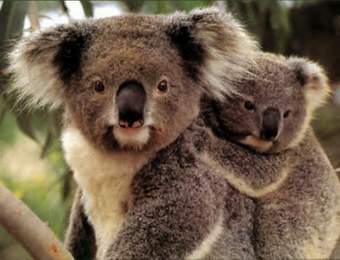 It also has a practical side of giving the Koala Mama a much needed break! Also, an update on the loft mini-makeover? 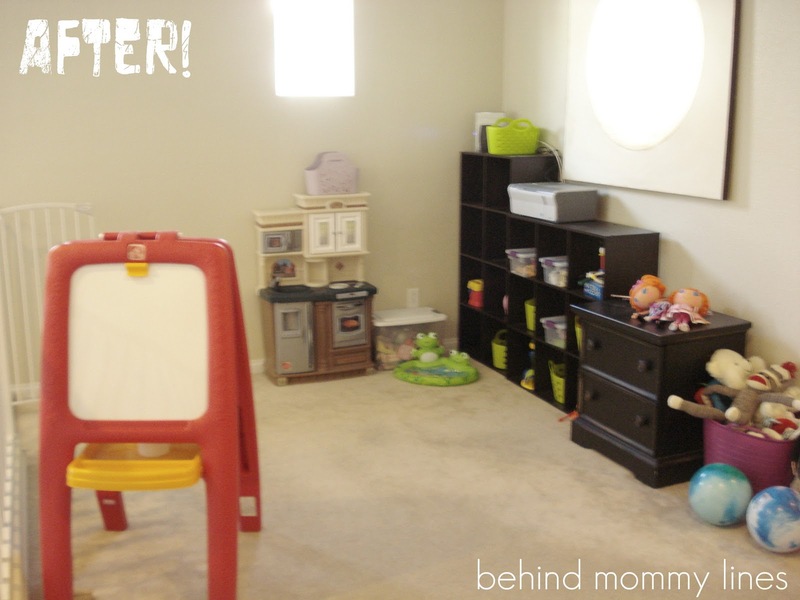 Turned into coveted playroom separate from the downstairs play area (the whole of downstairs, pretty much) + supervised yet contained area of play upstairs. After an extensive search of craigslist offerings, drooling over West Elm's furniture, and even a pondering about ordering some CSN Stores stuff, I cheaped out and got some Target sale items. I don't regret it, they'll work for now, and seem to be holding up just fine. It is light years away from the classy and designer look I was going for. However, after deciding to sell the house, we don't need designer right now! Just functional! And boy, howdy it is functional! 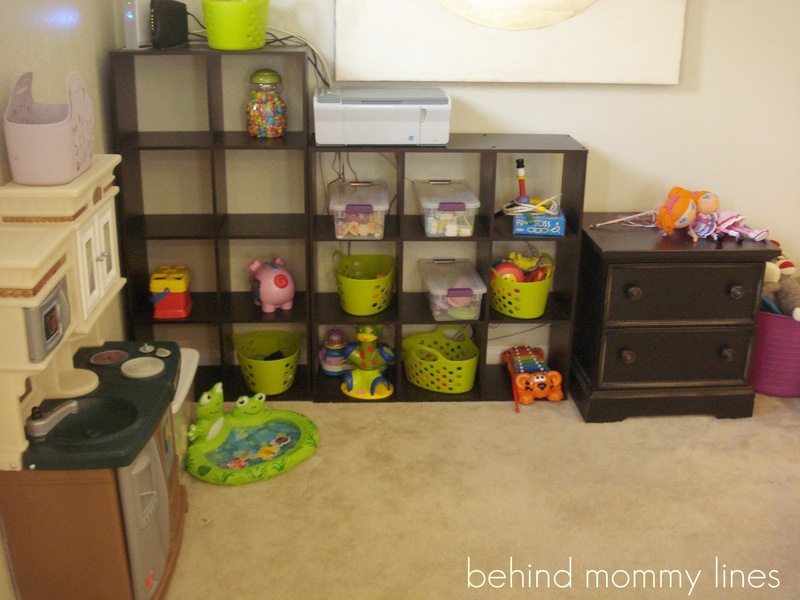 Yay for playrooms! The play area looks great! Love the shelving! NICE JOB, lady! Gee, you could be a host on HGTV... "Mommy Makeovers!"